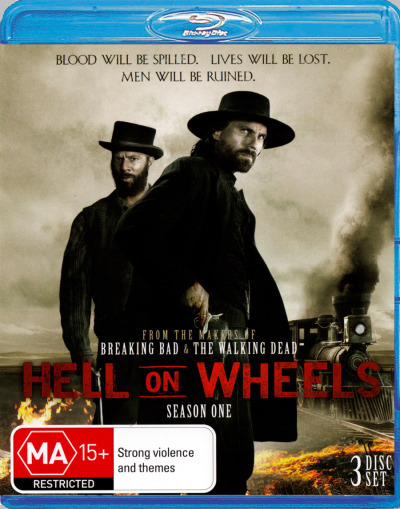 Hell on Wheels Season One Blu-ray Review. Hell on Wheels is a great new series from AMC, who have previously given us Breaking Bad and The Walking Dead. It’s a show filled with great characters, that looks fantastic. The American West, 1865. Former Confederate Soldier, Cullen Bohannon (Anson Mount) searches for the Union Soldiers that murdered his wife and son. His quest for revenge leads him Westward to the Union Pacific Railroad’s construction of the first transcontinental railroad and the lawless mobile town known as “Hell on Wheels”, that accompanies it. It’s here that he gains employment, first as a “Walkin’ Boss”, a supervisor of an all-black “cut crew” who prepare the land for track laying. While at Hell on Wheels, he comes upon information that there was more to his wife’s death than he originally had thought and his quest for revenge continues as he makes his way through the town and people in search of a nameless man known only by his rank as “The Sergeant”. Anson Mount as Cullen Bohannon is the shows main protagonist and entry point into the series. Mount gives us an interesting character in Bohannon. Granted, it’s what we’ve seen many times before; flawed man and soldier, who carries a personal code of honour. A man who did wrong in his past, but was shown that wrong with the help and love of a good woman. They’ve always been interesting to watch, but it’s Mount’s performance as Bohannon that really makes him a standout. A man who only speaks when he has something to say, with a great look, southern accent and presence, Mount puts so much through Bohannon in all these regards to create a great main protagonist worth watching. Hell on Wheels is full of a wide range and varied group of characters. Another is Elam Ferguson (Common). A freed slave working the cut-crew, looking for his own place and equal standing in the world. As the series progresses, Bohannon and Fergusson have their differences which culminate in a knockdown, drag out, fist fight in episode 5’s; Bread and Circuses, A standout in this season. We also have Thomas “Doc” Durant (Colm Meaney), the businessman and entrepreneur looking to make his fortune with the construction of his transcontinental railroad. Mrs. Lily Bell (Dominique McElligott), “The fair haired maiden of the West”. Joseph Black Moon (Eddie Spears), a Cheyenne Indian who has been baptised and taken up the teachings of Christianity. Sean and Mickey McGinnes (Ben Esler and Phil Burke). Irish immigrant brothers looking to make their fortune at the camp and Tor Gunderson (Christopher Heyerdahl). Durant’s Norwegian head of security, better known in the camp as “The Swede”. Hell on Wheels is a show about the American dream and the maturing of that country after it’s own Civil War and the emancipation proclamation, bringing eastern civilisation across the country and with that, the end of the American West. But at it’s heart, under all of that, Hell on Wheels is first and foremost a Western. With sweeping, grassy plains, horses, six-shooters, whiskey, poker and Indians. Where this show shines is in it’s casting, writing, production values and wide range of varied characters. The last western series we had like this was Deadwood. While that was a straight-up Western series, this is in the same vein, though it’s not quite as gritty, well written or as big budgeted as that, but this series stands on it’s own two feet for its own merits and I feel that this show will go farther than that series did. When it comes to the discs picture, during the daytime scenes and especially the exteriors, the picture is quite beautiful and at times inspiring. With a fantastic quality, which is one of the hallmarks of Blu-ray technology, every hair, pore, blade of grass and whiff of smoke is noticeable with amazing detail. Though, unfortunately with the night scenes, varying degrees of film grain can be seen present in the picture and especially the interiors and lower light scenes. But at the end of the day, this can be forgiven as the picture does look amazing and the faults are only noticed by the truly picky. Hell on Wheels is a great new series from AMC, who have previously given us Breaking Bad and The Walking Dead. It’s a show filled with great characters, that looks fantastic. It’s a little jerky here and there, but that’s growing pains of a series trying out things and making a stand on its own two feet, with some really standout episodes, including, brawls, races, Indians and shootouts. If you love a good Western (like I do), or a good dramatic series that’s a lot of fun, then you can bet you bottom dollar on Hell on Wheels!